A Latino mother and her grown daughters demonstrate the meaning of family loyalty in Zamorano’s debut. 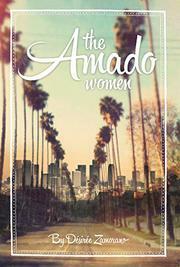 The Amado women represent a mixture of traditional and modern values, and each defines her life by a set of complex rules. Mercy has spent years church-hopping in an attempt to seek answers to questions of faith rising from a long-buried childhood incident. Once married to a drunken philanderer, she shrugged aside hardship to pursue her life’s calling—teaching—and waited until her daughters were grown before leaving their father. Oldest daughter Celeste is a successful investment manager whose early pregnancy and subsequent marriage interrupted the promise of acceptance at any number of Ivy League colleges. Now divorced, she lives in self-imposed exile in a different California city from her family, and she and her youngest sister, Nataly, are estranged. Nataly suffers from issues of abandonment and supports herself as a waitress to fund her true calling, art, and refuses to talk to her sister. Given the history of her father’s infidelity, she’s alarmed to find herself attracted to an older married man. Middle daughter Sylvia appears to be the most settled of the siblings. From the exterior, life with her up-and-coming husband and two young daughters looks perfect. But Jack’s a self-centered abuser with little conscience whose actions threaten to further harm his wife and girls. When a family emergency looms, the Amado women attempt to skirt their personal differences to provide assistance, but those barriers aren’t completely removed until an even larger crisis occurs. Zamorano provides a compassionate portrait of a family pushing difficulties aside to help each other; however, despite the author’s attempt to engage readers with multiple plot complications, the book is curiously flat.